But she tried very, very hard. With all those brothers, Edith has to embrace her inner tomboy! Oh my gosh, watching the insatiable curiosity and wonder of kittens is one of the big joys of fostering!! And it's going to sound corny, but I swear it's contagious and that's a very good thing for the humans who have the pleasure of being with them in kittenhood. Edith would have done much better if she had actually been on the field like this kitten! Cute! I love how she keeps getting longer in each pic. OMG! 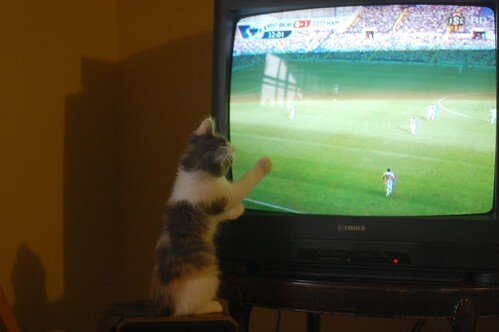 Here's another soccer-playing kittie!! I have to show this to my brother! 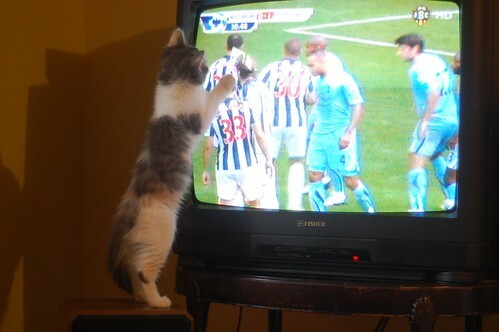 Kittens + HotSpurs = awesomeness! who on earth is a hotspurs fan in your household? strictly liverpool here...through thick and uh...thin (lately). 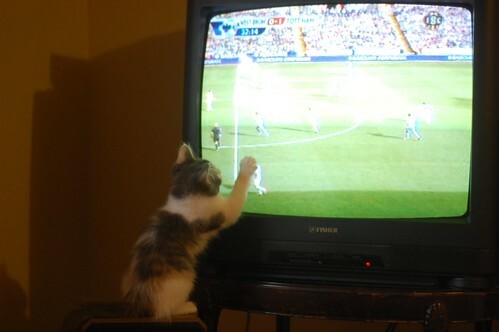 i also find it funny that some cats are into the tv and others aren't. Has Edith watched any auto racing? I've had several cats - not just kittens - who would sit in front of the TV watching the cars go round and round! My us loved watching the World Cup on TV. He also was front and center. He tried to catch the ball, but it kept getting away from him. It was just too darn cute! I guess I should have really previewed it. It should be My Gus not my us. Almost as much fun as sitting on a lap tapping the computer screen. Edith is quite the polite fan. it looks like she did not get in anyone's way...better than some humans! Awww, you still win for effort, Edie! My eldest kitteh loved watching the Winter Olympics one year. And she was obsessed with the Teletubbies for a while. Cute photos! My tabby kitty loves to climb the TV too. Quickest way to hear a person scream...kitty stretching with claws out on the flat screen tv. Noooooo!!! 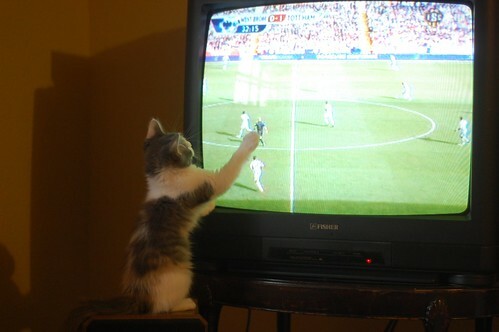 farah ~ So sorry to hear of the kitty/futbol rivalry in your household. Everyone in our home is SF Niners and Giants fans. My way or the highway. Edith certainly shows her enthusiasm for the game. You go, girl!! Roughing up the ref in the first photo might have something to do with her loss. It's good to see she's still there to congratulate the Spurs after the game. Well we fink she is a WINNER ennyway! So, Edith, did you really think you wouldn't get a red card for scratching Paul Scharner's back into a bleeding mess? Girlfriend, this game has RULES! Arsenal fan here, but with sympathies for Liverpool. Watching Man U v LFC right now! Oh my, Edith, you are so adorable I can hardly stand it. Ahh it looks like she tried really hard, poor Edith! !